All transactions are safe and secure with a reliable history in online purchasing behind each of our associates. 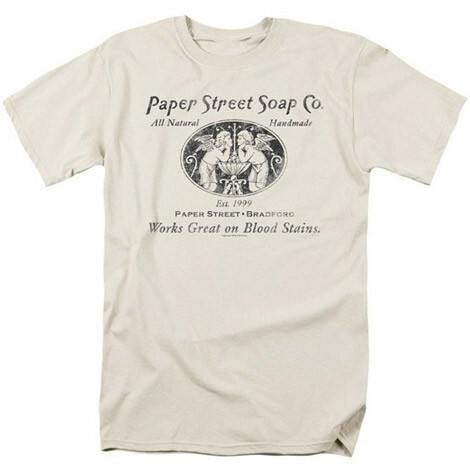 Buy the Paper Street Soap Company t-shirt to own Fight Club clothing and merchandise. This great Fight Club Soap Company t-shirt could pass for official company clothing. It features the logo for Tyler Durden's Paper Street Soap Company. Wear this tee and tell everyone that you sell "all natural, handmade" soap. If your customers are skeptical, you might point out that it works great on blood stains. Pick up this piece of merchandise to promote the company's soap, which is made from human fat. More colors available! In addition to the Paper Street Soap Company tee above, browse the Fight Club Clothing Gallery for more apparel like men's and women's clothes, kids shirts or hoodies.